Marc Lore is the president and CEO of Walmart eCommerce in the US. He founded Quidsi and sold it to Amazon in 2011 for over $US500 million. Then he founded Jet.com and sold that to Walmart in 2016 for $US3 billion and stock. His first startup was acquired for $US6 million. Lore says radical transparency, choosing the right cofounders, knowing finance, and selling to the right company are key to his success as a businessman. Marc Lore’s first big startup sold diapers before it was bought by Amazon for more than $US500 million. But after it was acquired, Lore says he felt let down. After Amazon he went on to found a competitor, called Jet.com, which he recently sold to Walmart for $US3 billion in cash plus stock. He’s had a number of reasons to celebrate, and now he’s the president and CEO of Walmart eCommerce in the US. And the stock is way up. On this episode of “Success! 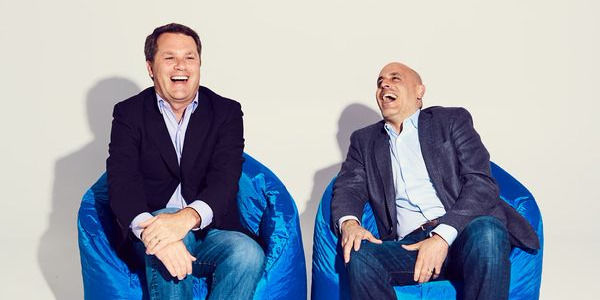 How I Did It,” Lore explains how he founded several companies with his childhood friends, and what made the Walmart deal different than Amazon. Radical transparency with employees so they believe in your vision. Coming up with creative ways to launch your product (he gamified the launch of Jet.com by offering 100,000 stock options to a stranger, and got tons of people to sign up). Working with cofounders you like. Lore has started companies with the same childhood friend. Having a background in finance and a vision for a giant, multibillion-dollar opportunity to tackle. These can help you keep a startup afloat and raise venture capital. Choosing the right buyer if a company wants to acquire your startup. Lore says he felt depressed after selling Quidsi to Amazon but much better after selling Jet to Walmart. The key difference: He feels he’s a more integral part of Walmart’s organisation, and his team isn’t being left alone to operate without help. We started our conversation by talking about how he grew up on Staten Island and went to Bucknell University. Marc Lore: I’d always been an entrepreneur. In grammar school and high school I loved entrepreneurship. But when I went to college and was graduating – this is in ’93 – there really wasn’t this sort of tech community and startup community that there was now. I would have loved that. But then it was sort of banking or law and medicine, things like that. I studied finance in undergrad, spent the next seven years working in banking as the market and the whole dot-com boom was sort of taking off right, and I sort of couldn’t take it anymore. At one point, I knew I didn’t want to be in banking. I knew that wasn’t my calling. I wanted to be an entrepreneur. And so I found and contacted two of my best friends from grammar school, said, “Hey, how are you guys doing seven years into your career? Do you want to start a company?” And, yeah, they both did. And so the three of us started The Pit. Shontell: The Pit was different than what you’re doing now; it was a trading company for sports cards, right? Lore: Yeah, it was meant to be a sports stock market where you can buy and sell professional athletes, like stock using the baseball card as a proxy for the athlete. So you never had to take delivery of the cards – we just kept them in a vault – and people would just trade them, buy and sell. We had market makers, we had price charts and ticker tape, and everything. It was really fun. It was a great experience. Shontell: The finance background is really valuable in entrepreneurship. Money, and dealing with money, and figuring out the finances – if you don’t know how to do that – can be a really fast way for your startup to die. How do you think having that finance background has helped you in your business ventures? Lore: There’s a lot that has to do with financial planning, of course. But also financing the business is critical, and being able to sort of think through the financing rounds, and what it does to the share price, and what it does to investor returns, and understanding risk and reward. You know, I spent most of my career in risk – financial risk. And so it’s no different, really, in the way venture capitalists think about the investment. They’re putting in money, and there’s a small probability of a big outcome, and how do you create the right, you know, risk profile for the venture capitalists and be able to communicate it in a way that makes sense? I think that’s a big part of raising capital. Shontell: The Pit wound up being successful. It’s not easy to make a first startup or any startup successful, but it sounds like you guys were. And you exited either right around the time the bubble burst, for about $US6 million? Lore: After the bubble burst – nine months in. Lore: The bubble had burst, and we never raised any venture capital. It was all from angel investors before that, to start this company. And we’re doing well, bubble burst, and we thought, “OK, time for the next round; let’s raise some venture capital.” And the whole market was just shut down – nobody would even take a call. The whole thing had blown up, and then we got an offer from Topps, the baseball card, and Bazooka, the gum manufacturer, and we took it. 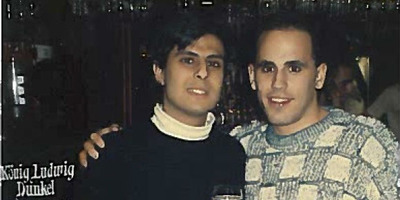 Courtesy of Marc LoreLore founded Quidsi with his childhood friend Vinit Bharara. Shontell: And so the next company was Quidsi, in 2005. Shontell: And that was again with a childhood friend – was that the same one? Lore: It was Vinnie Bharara and Lax Chandra, the first business, and then me and Vinnie did the next business. Shontell: So what’s it like to found a company with a childhood friend? I mean, you’ve clearly made it work. Lore: Yeah, you know, it’s all about enjoying what you do on a day-to-day basis. And getting to come to work and build something and do it with your best friends is, you know, it makes it that much more enjoyable and fun. And that’s why I do it; it’s almost entirely about the fun of the experience, and, like any experience, doing it with people you enjoy being around makes it that much better. Shontell: So it sounds as if the idea for Quidsi came out of personal need. At this point you have a family and you needed diapers. Lore: I’d just had a baby – first baby – and, you know, it’s sort of a pain having to go out for diapers, usually last minute, and I was looking online, and there really wasn’t any place to get good prices and fast delivery on diapers, which was kind of crazy. This was back, probably in 2003, 2004. Started doing some research and realising that people thought about it – obviously many, many people had thought about it – but they said the economics didn’t work, because the diapers are too heavy and bulky to ship. And they’re already loss leaders. So if they’re already loss leaders, then you have to pay all this money to ship these bulky things. You could never make money. Shontell: What’s a loss leader? The loss profile might be different, but we would drive traffic and mums to the site, and then we’d sell them everything else, and that was sort of the thesis. And that’s how it sort of played out. We lost money on diapers, we made money on other baby products, whether it be baby clothes or strollers or car seats, or baby care, stuff like that, and then we started selling pet stuff under a different domain, Wag.com, and drug-store-type stuff. And then toys and clothes, and in the end we had, like, 10 specialty websites that were kind of built off the back of this core demo, this mum who had a baby in diapers. Shontell: So how did you scale a company in 2005? This was a year after Facebook launched. It was not a viable source of people like it is now. So how did you get people on your site early on? Lore: We did, obviously, the basic e-com, like search-engine marketing, but there wasn’t a ton of search-engine volume on diapers at the time. A lot of it was old-fashioned direct mail, billboard, and subway advertisements. We really focused on the big urban centres. And at one point had an incredible share in New York City and San Francisco – that’s where a good majority of our business was being done. Lore: Zero, yeah, nothing in retail whatsoever. And we started actually selling product, because it was self-funded in the beginning by Vinnie and myself, and we would just sell stuff online, and then go buy at BJ’s and Costco and Sam’s Club, and we really had to do that because Procter & Gamble wouldn’t sell us diapers direct. For at least two years they said no. They didn’t think that was a viable business, so they weren’t going to sell us, so we had to continue to buy from the club stores. Until the clubs eventually [realised] we’d clean them out. So many clubs would beg Procter & Gamble to sell to us, because their customers were coming in and they weren’t getting any diapers. And they couldn’t stop us from buying it. And it was not until they called Procter & Gamble and said, “Please, would you sell to Diapers.com?” that we got it. That was sort of funny. Lore: Yeah, and we’d tell them. In the beginning they’d say, “Listen, here’s the deal: Leave us some diapers, and we’ll help you put it on the truck.” And so we did that for a while, and they were happy and we were happy, but we weren’t getting and going direct. It was harder and harder to buy truckloads and truckloads of diapers, like, every week. So then we said, “Let’s take a different strategy here. Let’s clean them out and ask them to call Proctor and Gamble,” and the strategy worked. Shontell: In 2009, that’s the first time Amazon got on the radar. It sounds like a vice president was sent in to have lunch with you. Is that what happened? Lore: We did meet some executives from Amazon considerably early, a year or two earlier than when we sold, ultimately. Shontell: So what happened in that meeting? Because the way that the tale goes, Amazon began to kind of threaten you and be, like, “You must work with us, or else we’ll kill you on price.” Is that what happened, or has that just been blown up? Lore: Yeah, that has just been blown up. It expressed an interest in learning more, and it was a good conversation, and we said we’d stay in touch. They said if we were going to do anything, with anyone else, please let them know first. That was really it. It was a pretty standard conversation that one would have with the startup that you were interested in staying close to. Shontell: Was that interesting? Were you thinking about selling? Does an entrepreneur ever really not think about selling? Lore: At that point we weren’t thinking about it at all. I mean, we were growing, doubling each year, having fun, really enjoyed coming to work, enjoyed the people we worked with, hiring great people. There was no interest whatsoever at that point. Lore: Yeah, my memory’s sort of vague at this point, because it’s starting to approach 10 years ago. But I remember it being yeah pretty competitive, pretty intense, every day. It was a battle. Shontell: So how do you survive a big company that wants to play in your space? Lore: We sort of doubled down on the brand and the emotional connection, and just kept pressing the tiny little touch points that we did for customers that were differentiated so that it wasn’t about price, so that even if we had higher prices we’d still have a very healthy business. And so that’s what we did, and so after they did drop prices pretty significantly – like, unheard of in diapers – it didn’t impact us as much as it did other people, including themselves. We didn’t lose that much business – we lost some, sure, but you could argue that what was left were the customers we wanted anyway. The people that were spending a lot of money on the site. It wasn’t just about the price of diapers: They liked the service, they liked the brand, and everything we stood for in terms of the values and stuff. So actually, after that happened, we withstood that, we actually had a new sense of confidence that, “Wow, we’ve really built something here that goes well beyond price,” and that’s really what a brand is, right? It’s price-defensible. You can’t beat a brand by just depending on price; that’s what private labels do all the time. Same quality, lower prices doesn’t mean that people still don’t want Kellogg’s Frosted Flakes, because the brand has a meaning, right? Shontell: Eventually you did sell, for a hefty price. I think both Walmart and Amazon, it sounds like, were interested, and ultimately you went to Amazon for more than $US500 million, a massive exit. So that is probably a game-changing moment in your life, right? Your last company had been sold for $US6 million. This is like life-changing number, a life-changing thing for your company. How do you process that? How do you decide where to go? Lore: You think we would have been celebrating, like, “Wow, we just made enough money that we never have to work again,” that sort of thing. “Family is set, grandkids are set,” and everything. And it was this really depressing sort of moment where we didn’t even want to go out for a drink. It wasn’t a celebration; it was sort of like mourning. That’s what it felt like. And it was really weird. We were like, “Why do we feel so bad right now?” Like, we just sold this company and made a lot of money, and we just didn’t feel great. Shontell: Why do you think that was? Lore: We had a real purpose. I think a lot of entrepreneurship is about, like I said, having fun building something, being empowered to make decisions and run, build your own unique culture, hire the people you want to hire, watch them grow and develop, and go on to bigger and better things, and learn while they’re there. It’s, like, there’s a lot of benefit of doing it that go beyond dollars and cents. And I think that hit us, like, “Hey, in this new structure, this new world, a lot of the things that made us happy are not going to exist anymore.” And so you start to realise there’s not any amount of money that can buy your substantial drop in happiness, right? There’s really no price for that. I think that’s we kind of realised. It’s like, “Hey, nothing’s really going to change.” We had a nice house, nice cars, clothes, food, like, we were living fine before. It wasn’t like the money was going to suddenly bring us from poverty to sort of sustainability, right? And we knew we’d always be able to make money; we had good, you know, salary earning potential outside of this. So I guess the money really just didn’t do it. And people ask, “Well, then why’d you sell if you knew this beforehand?” We didn’t exactly know how we’d feel, and we also knew at that time it was much harder to do $US100 million and $US200 million raises; nobody was really doing that back in 2010. I think the venture community was more sceptical at the time about what would happen in the future, how much more aggressive might they get things. And we were thinking that it would be a safer way to go, I guess, at the time. Shontell: So it wasn’t long before you were thinking about the next thing. Lore: I learned a really good lesson: both how I approached acquiring companies, and also how I think about being acquired. I think traditionally what you hear when companies acquire companies, they say, “Let’s just leave the company alone, let them do what they were doing, don’t mess with the culture. Of course there will be things that poke at it, but they will be really happy, because we’re not sort of interfering at all.” And that on the surface sounds pretty logical, but if you’re suddenly part of a bigger organisation, and you’re left alone, it feels sort of isolating, and the acquirer feels like they’re empowering because you’re doing exactly what you’re doing before, because you don’t have the latitude to sort of operate completely independently. And at the same time, you know that there’s a bigger mission and vision that you sit underneath that you’re not a part of. It’s kind of like depressing, right? So, empowered to do what, exactly? Right? Like had Amazon said, “Hey, don’t leave them alone, give them the keys, they know baby, let them run baby for the whole mothership, let them drive this whole mum strategy.” Totally different. Would have been excited probably, probably would have gone down a different path completely. 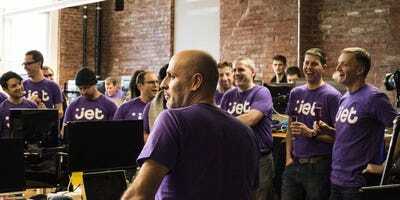 Courtesy of Marc LoreLore founded Jet in 2014 as a competitor to Amazon. He’s pictured above with the original Jet leadership team. Shontell: So you’re almost too isolated. Lore: Yeah. And one of the things we did when we went out here at Walmart and bought these different companies, Hay Needle and Shoes.com and Mod Cloth. We’re trying to empower the leaders to actually impact the overall organisation. And that’s hard to do, but empowering people, I think, is the magic, as opposed to isolating. And that’s a lesson I learned, because I felt it, and now I’m trying to use the lesson on myself here at Walmart. Shontell: So let’s go back to Jet for a second. So you come up with this idea. You and I actually met at a party, you were excited, you were like, “I got this idea on pricing and I’ve got this innovation on price, I think I can just get really low prices that haven’t been seen before.” And what you were ultimately talking about was this company, Jet.com. So what was that innovation you felt like you had, where you could do something that hadn’t been done before in e-commerce? Lore: When you think about what prices you can charge online, it’s directly correlated to what your costs are. If your costs are lower, you can charge lower prices, and a big portion of the costs are centered on logistics: shipping and fulfillment. And shipping and fulfillment are incredibly volatile on e-commerce transactions. Shipping could be just a few per cent of sales or it could be 50% of sales; it really depends on the size of the basket, the weight of the items and things. If you were shipping something that was heavy, and low dollar value, like a $US15 heavy bag of dog food, it could easily be $US10 to ship that. Whereas you can pay $US5 to ship, you know, $US150 worth of apparel, right. Like, it changes dramatically. It also changes based on location and proximity to the customer. And I realised that everything was being priced to the average logistics cost, in general. And what I thought was, “Could we at Jet sort of untangle that and really make these costs transparent to consumers as they shop, and then empower them to make choices around saving money by pulling logistics costs out of the system?” And so, for example, in the easiest, most basic case, in a third-party marketplace, you go to buy in a marketplace and there is the seller with the best price. If that seller is located across the country, they get killed on shipping. If the customer’s located down the street, they’re really happy. So shouldn’t customers know that? And shouldn’t the retail be able to change its pricing based on proximity? And so making that transparent is easy for an item, but at the basket level, if you’ve got two things in your shopping cart – like a bag of dog food and a dog bowl and you search for a dog leash – surfacing products that can ship in the same basket from the same warehouse in close proximity is going to be way cheaper to ship than if the leash has to split-ship, like in a completely different package from a different place. And so we built these algorithms to do this in real time, and we created this concept of smart savings, where we’d give customers at the product level incentives to choose certain products over another, when the marginal cost to ship was lower. The result was bigger baskets, lower shipping costs, and ultimately the ability to charge lower prices. Shontell: And did you find that that ultimately worked? Adding a lot of transparency to shopping carts? Lore: It did. The basket size was higher, the shipping cost were lower. Yeah, it absolutely worked. Shontell: One of the original ideas you had was this $US50-type Costco model where you had a membership and then, pretty soon after the launch of the company, you did away with that. So sort of doubling down on an advantage we already had, that was the original thesis. And then as we got into it and we were testing early on – this was really early on – the economics just worked better to have more sales and make less margin and not charging membership than charge it. Shontell: I feel like sometimes founders start a company based on an idea and they’re hesitant to say that it doesn’t work, and do away with it. Was that a hard decision or was it just based on numbers? Lore: Not at all – it was just really logic. You can’t get married to these decisions at all. I mean, you have to be open, constantly rethinking. I think it’s one of the things that I’m learning here being at a big company versus a startup. At a startup, you’re changing your mind so quickly because you’re processing information in real time. And as you get more information, it’s almost like machine learning. You get more information, you change your decision. You get more information, you change it again. You get more information, you change it again. And in a small company you can bring everybody along pretty easily, because there’s, like, 10 key people, and they’re sort of involved in every decision, and they sort of track, where in a really big company, it’s much harder to do that. And that’s been a big challenge is just balancing that, you know, “Get information, adjust, move fast,” with the communication piece. I think that’s always a challenge, and I’m learning that lesson and how to sort of deal with that every day. Shontell: So scale was really, really important, and you had a cool innovative thing that I didn’t even know was possible to do, to gamify getting early signups. You offered 100,000 stock options, I believe, to whatever stranger was able to get the most people to sign up for Jet, before it really even launched. Lore: Yeah, we had an app with a ranking system, and the more people you got to signup, you can see where you ranked relative to everyone else. And it was like a fun competition; people liked to see their ranking go up and down depending on who they told. Shontell: But that brought in, what, hundreds of thousands of users? Lore: Hundreds of thousands before we launched, yeah. Before the stock was worth anything. Shontell: Those guys probably got a pretty good exit when you sold to Walmart. Lore: The top person is probably around $US1 million. Shontell: That’s amazing. Well, that’s a cool strategy. It seems like it worked really well. I guess Quidsi, you had raised a lot of money, but this one it seemed as if you were just, like, “Let’s go big really fast.” I think you raised something like $US80 million before it even launched. Lore: It was $US55 million in the seed round – that was with the business plan. And then before we launched we did another $US100 million. Shontell: You had a business plan? I feel like people don’t do business plans anymore. Lore: No. We had a business plan. Shontell: I guess if you want to raise $US55 million on seed round, then maybe have a business plan. What was the thought process behind that? Was it just, like, “We need to get to scale really fast, and I need as much money as possible”? Lore: Yeah, being a mass merchant, scale’s incredibly important. So we knew we had to spend a lot of money in marketing, and we knew we had to get big fast. And we needed to get and generate billions of dollars in revenue, and get on that sort of trajectory to get to a number where the business economics make sense. Shontell: If you can raise that much money pretty early on, it can’t be just because you’re a great serial entrepreneur. How do you get investors sold, and employees sold on this huge vision that you’ve got? Lore: Part of it is having the big vision and not being afraid to take risk and go for it. The asymmetric sort of risk profile of sort of the possibility of a big outcome, I think, is really key. It’s just not that interesting to say, “We’re going to spend the next five years and build a couple of hundred-million-dollar businesses,” like that’s not that interesting from an investor standpoint. I think in terms of the financial planning, being meticulous about what the long-term plan looks like, what do the at scale economics look like, and how you’re going to execute and work backward from that. Right, so being really clear about “This is what we’re going to do, then we’re going to raise more money, and then we’re going to create more value, and we’re going to do this.” That was a big part of it, too. Shontell: I think that you had three philosophies when you were starting Jet. Trust, fairness, transparency. Lore: Yeah, those were our core values. Shontell: So easy to say, hard for some to do in practice. Lore: Yeah, this is another lesson I learned after doing a few companies. I wanted the values to be values that the company lived and exhibited in the way in which it operated and the moves the company made. And so a great example of that would be in terms of transparency: The company was very transparent with financial information, about how the company is doing. We created an app where people could follow along the daily performance of the company. We were transparent with salaries; everyone knew what everyone else was making in the company. Lore: Everyone. It was posted. It tied into the fairness where everybody at the same level in the company made the same amount. So whether you were a man, woman, doesn’t matter, like everyone gets the same, and I thought that was really important that there wasn’t any sort of weird unconscious bias happening, that everybody at the same level got the same amount. And when we hired somebody from the outside, we would basically size that person up and everyone would interview them and say, “Yep, director.” And then we’d go back and say, “OK, everyone thinks you’re a director, go on LinkedIn, check out the other directors, we really feel like you’ll feel like you’re a director. Here’s what you make.” And people would say afterward, like, “I just really appreciated not having to negotiate, knowing that it was fair.” I think a lot of times people just want to know that it’s fair, right? Like, most companies you don’t know what people are making, and then you find out, and then you’re like, “Wait a second – that’s not fair.” I’ve heard that word over and over and over being used. We eliminate that, because it’s open, everyone’s making the same, and so that’s one example of how we live those values. Shontell: How interesting. Can you still do that at Walmart? Shontell: It’s a massive company. Shontell: So pretty quickly into the company, first off, you get to a billion-dollar run rate, so you do scale really fast. But then, these offers come back. You have Walmart knocking on your door. What was it within a year of launching? Lore: Within a year, yeah. Courtesy of Marc LoreMarc Lore, right, said that he knew he wanted to sell to Walmart when he spoke with CEO Doug McMillon and saw they had a shared vision. Shontell: So how did you weigh things at this time, going from an experience where you sell and you don’t even want to get a drink with your cofounder because you’re kind of depressed, to this, where Walmart comes knocking? Lore: It was really interesting … So I met Doug. Shontell: Doug McMillon, the CEO of Walmart? Lore: The CEO of Walmart. And we had a few discussions, and it was really in the beginning just about partnering. How can we work together? And we both realised that we shared a similar vision of wanting to create this e-commerce business that customers absolutely loved, and so we shared a similar vision, we were sort of building trust. And so that was incredibly compelling at the time, and we built a lot of trust and realised at that point, like, that slight difference in sort of mentality meant everything – that was the difference between being depressed and being really happy. And so when people say, “Yeah, but you sold,” and I said, “Well, we sold the company, but we didn’t sell out, which we did the first time.” We didn’t sell out because the vision we had is the same. Now we can get there faster with a higher degree of certainty. And that’s all it comes down to is, like, can you achieve the vision you had set out to achieve? That’s when it really clicked for me, I was, like, “Wow, that’s everything: You buy a company, you have to make sure that the vision is intact and can get there faster than they would have on their own.” And if you can solve that, that’s going to be super successful in the future. Shontell: Were you able to be transparent with the team as this was going on? Lore: Could not. It was really tough. We were super transparent, and for legal reasons we obviously couldn’t talk about it. That was really, really tough. Even after it leaked, we couldn’t talk about it, and that was tough. JetLore made setting a clear vision his top priority when transitioning to his leadership position at Walmart. Shontell: Acquisitions are really easy to mess up, but it seems like everything has been smooth sailing, and stocks up 40%, you’re now running all things digital e-commerce at Walmart, CEO and president of Walmart.com. So what was the state of Walmart when you came in, and what was your first order of priorities? Lore: Early on, it was just to assess the organisation and the structure and the people, and set a clear vision, make sure we have the right people in the right spots. Then, after the first six months, we started doing things to change the customer value, like going to two-day free shipping with no membership, launching easy reorder, and pickup discount, start to leverage Walmart’s unique assets. And did a few acquisitions to help drive some of the long-call categories, bought a couple of digitally native vertical brands, Bonobos and ModCloth, that’s more about playing offence, and giving us access to unique assortment. And then we built Store 8, which was really about preparing for the future. We really wanted to help shape the future of retail, and I didn’t want to have the same people thinking about the business today also thinking about the future, so we said, “OK, let’s segregate that from the rest of the business, call it Store 8, and we’ll build startups.” It’s a sandbox to kind of play around with potential innovation concepts. It was really to say, “No, let’s treat it, like – what startup would we build today that we think has a chance to change the future of retail? What’s the vision?” And that’s what really got me excited about coming to Walmart. Shontell: You’ve got a long career ahead of you, but you have an impressive career behind you. If you were to give advice to someone who was a budding entrepreneur, kind of wants to take their first big swing, knowing what you know now, what would you tell them? Lore: I think the very first thing is that you want to surround yourself with the absolute smartest, most capable people that you possibly can, both hiring, also advisers and investors. Those relationships you make are not only helpful in the business you’re currently in but will be the next one and the one after and the one after that. And so if you’re going and willing to work super hard, and be tenacious, and take risk, and surround yourself with great people, then even if that business doesn’t work out, you’ll know pretty quickly, especially if you’re taking risk and being aggressive. And you’ll take those learnings, take those relationships, and be able to start again from a higher platform. You keep wanting to move to a higher platform each time, right? I didn’t know this at the time, but I was fortunate to make a lot of good relationships early, and those relationships stuck with me each venture that I did beyond that, right? So, I’d probably say that’s the most important thing. Shontell: Great. Well, Marc, thank you so much for your time. It’s been fun. Lore: Thank you so much, Alyson. I appreciate it.